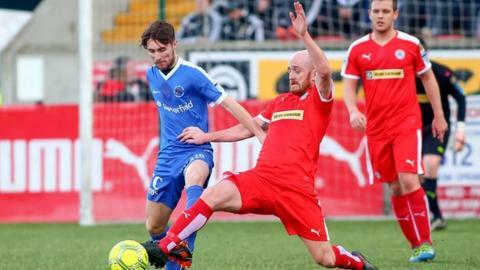 Cliftonville midfielder Ryan Catney will leave the club by mutual content at the end of this season after a 12-year stint. Catney, 32, joined the Reds from Lisburn Distillery in 2007. The tough-tackling midfielder's honours with the club including being part of their successive Premiership winning teams in 2012-13 and 2013-14. "I'm disappointed to be leaving but I have a lot of great moments to reflect on," said Catney. "I contributed as much as I could every time I was on the pitch and feel lucky to have been involved alongside so many great players. "Cliftonville has been such a big part of my life and will always be a part of me. I'll always be proud of what I achieved here." Saturday's North Belfast derby against Crusaders could potentially be Catney's final Solitude outing for the Reds. Cliftonville chairman Gerard Lawlor said the parting with the former Reading player was made "with a very heavy heart". "While we've held a number of discussions lately, to finally confirm the end was difficult," said the Reds chairman. "There are no words I can use to do justice to Ryan's commitment, passion and determination. His love of this Club and his family make it hard not to stand in admiration." Since making his Reds derby against Limavady United on 11 August, 2007, Catney has made 394 appearances for the club, scoring 13 goals. He played in Cliftonville's four successive League Cup triumphs while he also enjoyed County Antrim Shield success with the club in 2008, 2011 and 2015. Catney's central midfield partnership with Barry Johnston played a crucial role in the club's two successive Premiership triumphs. His outing against Nordsjælland earlier this season was his 18th European outing - a club record. That game came a few weeks after his return to action following 17 months out because of a double leg break in January 2017.